The big day has finally arrived! ICDC finalists and cake enthusiast trooped to SM The Block to witness the 10th Goldilocks Cake Deco Challenge activity. Since the 10th year of the ICDC, coincides with the 50th anniversary of Goldilocks, they've added some major twizts this year’s lCDC Xtreme competition. Ten schools showed off their killer cake decorating skills for a chance to last February 25, 2016. It was a whole day of fun at SM North Edsa. Each team was given a working station with a supply bin of decorative materials so that each group has everything in it for cake decorating. The theme details were only revealed to the finalists the minute the contest began. 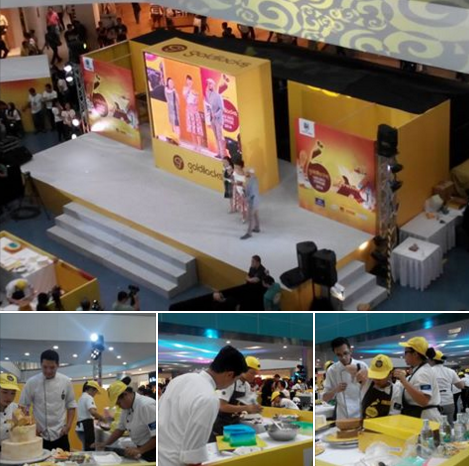 A panel of judges from culinary arts industry (Penk Ching, Heny Sison, Millie Dizon, Carol San Pedro, and Cara Wu) rated the cakes set on the workstations. They walked all the way around each cake and looked at it from every angle. Competing teams came up with cakes designs that are simple, sculpted, or classic with a lot of piping or stringwork that fits the theme given to them. The best showcake team entries in each Category (50th Birthday, 50 Wedding Anniversary, 2050 "Future" cake, Gold cake and the Number 50 cake) were then recognized after their scores were tallied. And the 10th Goldilocks Cake Deco Challenge Grand Champion was Saint Anne College of Lucena! Their team had mastered and combined many techniques into cohesive designs required in the competition. Their hardwork under mentorship of Chef James Antolin paid off. Saint Anne College of Lucena received a baking showcase worth a quarter of a million pesos. The winning team received P20,000 in Goldilocks gift certificates during the awards ceremony.